Hello again! I, Love Calissendorff, am back to tell you a bit more about my findings concerning infrahumanisation in South Sudan. The research I was carrying out as a Summer Field Researcher from the University of Oxford is now finished and my findings provide some interesting insights into what the Dinka and the Nuer think about each other. Before I go into detail about that, let me tell you a bit more about my experience doing research in South Sudan. I found the country really beautiful and green, and of course much warmer than my home, Sweden! The red sand of Juba and the city itself was definitely different to anything I have experienced before. In fact, the beauty was quite distracting allowing me to forget – if only for a second – the horrors of December 2013. In addition to the country itself, I found the South Sudanese very kind and polite, and I always felt welcomed and respected. Many people expressed excitement and held hope in the possibility for peace, and moreover they were very supportive of me, as a representative of Generations For Peace, coming to ask for their thoughts and opinions. Being accompanied by local GFP Delegates such as Paul Wel and Dora Wango also helped a lot. Having locals with me while I carried out my research put my interviewees at ease, the fear that we would just ask questions and then leave was abated. 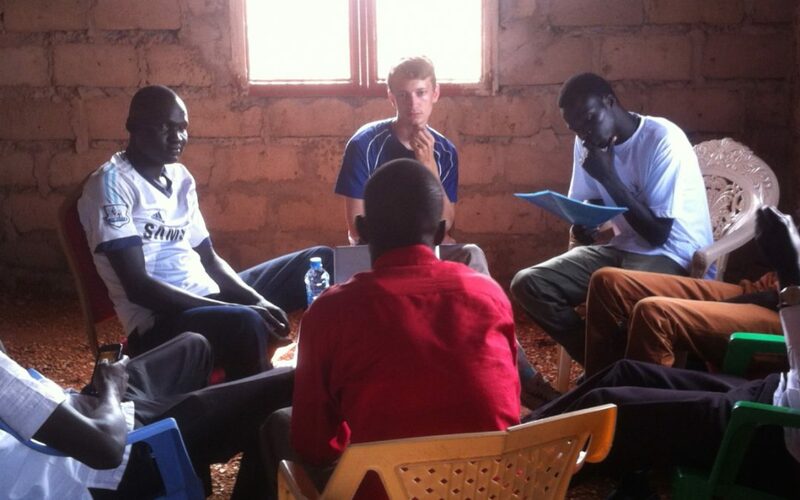 While the locals believed that genuine peace has to be made by South Sudanese for South Sudanese, the fact that GFP is trying to work with local people to achieve long-term sustainable change was embraced and considered important to most everyone I met. Regarding the findings, it was interesting to hear that both Dinka and Nuer often referred to each other as ‘brothers’. To me, it shows that there is a sense of unity and national identity in South Sudan, which also means that there is a prospect for peace and stability. However, I also found that many people have been deeply affected by the recent violent conflict. This has in turn made many suspicious towards other ethnic groups. I fear that this will make peace building more difficult. After all, people tend to not want to spend time with people they are afraid of, or do not trust. GFP programmes offer a very important opportunity to change these attitudes. By bringing people together through various activities, such as Dialogue For Peace Programmes (DPP), the affected communities can take the first steps towards changing the negative images they have of one another, and build a more stable society together. Of course, all of this will take time, but at least this research has helped identify what the Dinka and the Nuer think about each other, how this is expressed, and what can be done to improve those attitudes. This is indeed only the first step on a long journey.